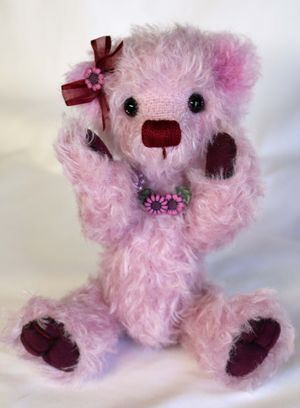 May is made from a pink curly matted mohair. She stands 8" tall. Her eyes are purple glass with painted sparkles. Her nose is burgundy perle cotton. May has burgundy ultra suede on her paws and foot pads with pulled toes and shading. Her fac is scissor sculpted with puffy cheeks. 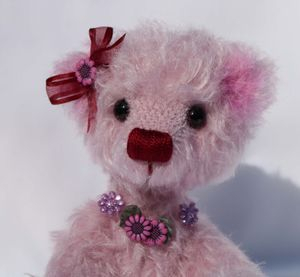 May has a flower necklace around her neck and a bow in her ear. May is 5 way jointed and is stuffed with poly-fil.